If you are committed to academic excellence, the liberal arts, social justice, and service, you have the makings of an Ambrosian. At St. Ambrose University, we look for students who are interested in developing intellectually, spiritually, ethically, socially, artistically, and physically. While SAU is a private, Catholic university, being a student here is more affordable than you might think due to grants, scholarships, our Bee Finished in Four Years Program, and other options to defray costs. Submit transcripts, goals, personal statements, and test scores, if required. See the different requirements for First Year undergraduates, transfers, adult accelerated, and graduate students. Submit a housing/meal plan application, if applicable. Before you apply, the best way to experience what being an Ambrosian is all about is by scheduling a visit. We look forward to meeting you soon! St. Ambrose University performed exceedingly well when evaluated by U.S. News & World Report and its 15 indicators of academic excellence! 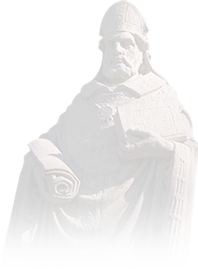 In 1882, Bishop John McMullen promised the sons of Davenport immigrants a place where ideas were important, so he started St. Ambrose University. Today, with highly-ranked academics, championship-winning sports teams, the arts, modern housing, and faith, St. Ambrose has it all. Find the path that best suits your situation. Then, we make sure your admissions process is efficient and hassle-free. Seeking a bachelor's degree? We offer more than 60 majors and the flexibility to mix majors, minors, and electives to match your interests. See our scholarship and grant opportunities. We are #1! St. Ambrose is home to 20 Scholar Teams as recognized by the NAIA for their academic excellence. Our championship-winning athletics department offers a total of 13 men's and 13 women's varsity athletic programs as well as 3 co-ed activities and teams. Students can transfer up to 90 credit hours from a four-year college or university and up to 64 credit hours from two-year or community or local colleges to St. Ambrose. Graduate students can choose from our numerous accredited graduate programs: 14 master's programs and 3 doctoral degree programs. Our international community welcomes students from every corner of the world! SAU's Adult degree completion program offers the flexibility and time-savings needed by working adults who wish to earn their degree and/or take additional classes. Reach your goal in half the time! Whether your goal is to earn a new degree or complete unfinished studies, we're glad you're back! We offer three master's degree programs completely online: MBA, MPH (Master of Public Health), and MCJ (Master of Criminal Justice). In addition, Registered Nurses also can earn their BSN degree online. The MEA (Master of Education in Education Administration) and MECE (Master of Early Childhood Education) programs are conducted mostly online with some classroom instruction.